Musically, the Canadian Opera Company’s current production of The Marriage of Figaro is a feast of delights. Visually, it leaves one famished and confused. The production directed by Claus Guth premiered at the Salzburg Festival in 2006. Guth says his influences for the production are Ingmar Bergman, Ibsen and Strindberg, but except for the off-white walls of Christian Schmidt’s set bathed in Olaf Winter’s cool northern light, it’s hard to see how Scandinavian playwrights or filmmakers have anything special to do with what we see. Guth emphasizes the battle between men and women, but that is already inherent in Lorenzo Da Ponte’s libretto. 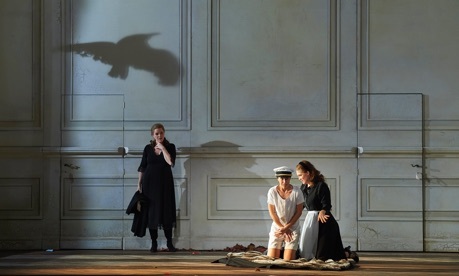 At least, Guth’s direction does not run perversely contrary to Mozart’s opera as did Christopher Alden’s in La Clemenza di Tito in 2013 or Dmitri Tcherniakov’s in Don Giovanni in 2015. Instead, it’s a question of a series of visual and dramatic ideas that are inconsistent in themselves and seem irrelevant to what is happening on stage. Guth’s concept for Figaro consists of two ideas that have no intrinsic relation to each other. The first is the location of the action of three of the four acts in an enormous stairwell. The second, is the addition of a silent character called Cherubim (even though it should be “Cherub” since “cherubim” is the plural). Acts 1 and 4 take place on the ground floor, Act 3 in the same stairwell one floor up and Act 2 in the Countess’s chamber since the creative team couldn’t figure out how to play the act in a stairwell. The width of the stairs is enormous, wider that the ramps of the Rundetårn in Copenhagen which allowed men on horseback to ride to the top. The complete lack of furniture in any act and the cracked and blistering paint leads one to think Count Almaviva doesn’t really have enough money for the upkeep of his palace. He should really ask the servants to close the large window stage right because the floor is littered with dead leaves and in Act 1 and 3 a dead crow. In Act 2 a crow seems to have impaled itself somehow on the handle of the Countess’s window. Are these dead birds Scandinavian signs of death? They are treated as such. Figaro in Act 1 and the Count in Act 3 simply pick them up (without using a handkerchief) and toss them out the window. What really makes no sense is that all the action, except Act 2, should take place in a stairwell. In Act 1 when Figaro sings of measuring whether a bed will fit in the room the Count has given him and Susanna, we wonder if that room is supposed to be the bottom of the stairwell just because it’s handy to both the Count’s and the Countess’s rooms. Not much privacy there, however. In Act 3, Figaro’s wedding to Susanna takes place on the second floor in the stairwell, but why there except for the inexplicable design concept? In Act 4, the outdoor scene also takes place in the stairwell. Since the stairwell is unfurnished, there is no place to hide except behind doors or behind the diaphanous curtains of the main window. At some point every main character “hides” there even though they can easily be seen. The complete lack of furniture is the least comprehensible part of the design. This means that all the characters, mostly clad in black have to sit or lie on what is manifestly a dirty floor, what with its dead leaves and birds. Some might say, “Oh, but it’s just an opera”, but if a director wants to make characters believable why make them do things that no one in their positions would do. At one point, Marcellina rolls an apple across the floor to Basilio and he eats it. I wouldn’t – why would someone as fastidious as he? The second feature of the concept is its added figure of Cherubim, played by actor/dancer/juggler Uli Kirsch. He is dressed exactly as Cherubino in a boy’s sailor’s suit, except that he has white wings sprouting from his back. He has magical powers – doors open automatically, he can draw people about with some force emanating from his fingers and can put people into a trance or bring them out of one. Our first impression is that Guth is using him to represent Amor or Eros to mischievously draw people together who, due to class hierarchy, should not be together. Yet, that is not what happens. Whenever a group of singers is on stage and Kirsch pops up, expression drains from their faces (not a good thing in an opera) and they suddenly act like marionettes that he is controlling with his hands, often making them use synchronized hand movements not unlike what one used to see in girl- or boy-groups in the 1950s. The most annoying aspect of Guth’s Cherubim is that, unlike Shakespeare’s Puck, he has no discernible effect on the action. He comes in, plays with people a bit and then departs. All the machinations are those of the characters and are already in Da Ponte’s libretto which is why there is nothing for this added character to do. The worst he does is distract us from the singing. His appearance often causes lighting changes, and the worst is when the characters on stage sing their ensemble after Figaro discovers his long-lost parents and the lights place them in silhouette so that we can’t see their facial expressions. In another tutti he rides in on a unicycle throwing feathers (his personal symbol of unknown meaning) at them. During the finale when all the characters have paired up, Cherubim tries to distract them, but they all push him away, as if their reaffirmed marriages rejected amoral Eros. All succeed except Cherubino, who, for unknown reasons, falls down insensible at his feet – dead, fainted, who knows? – but the fall unnecessarily adds a frustratingly unanswerable question to the opera’s last moments. Thus, Guth has given the opera a dull and unsuitable setting and then has tried to liven it up with the pointless addition of a distracting character. Besides this, there are a slew of minor bizarreries. Schoolgirls pluck the petals off their roses before they present them to Susanna. The old gardener Antonio enters from a window we are told is very high up and then he casts handfuls of dirt on everyone he sings to. Dr. Bartolo, first appears in a wheelchair but when he wants to pick something off the floor he does not wheel himself over to it but casts himself out of the chair onto the floor. Later, because of the stairwell, no doubt, we find he can walk with a cane, and eventually we see he doesn’t even need a cane. A production convinces with its attention to detail. Here inconsistency is the rule. At least, Guth has not meddled with the personality of the characters as did Alden in Clemenza or with the relationships of the characters as did Tcherniakov in Don Giovanni. His main change is to make the Countess appear as desperately in love with Cherubino as he is with her which means she can’t quite play the wronged wife as fully as she would like. Guth also makes the Count and Figaro unnecessarily cruel toward Cherubino. During “Non più andrai” they cut his arm with a piece of glass and smear his face with the blood. One might understand the Count’s anger, but not Figaro’s. ves a fine a account of all his main arias. Strangely, though, his face is almost without expression and he has no great stock of gestures. This, plus Guth’s characterization of Figaro as a nerd rather than a schemer, makes his Figaro, contrary to expectation, one of the least interesting characters in the opera. Fortunately, other cast members are both fine actors and singers. Russell Braun gives a great performance as the Count drawing humour both from his insane jealousy as well as his uncontrollable lasciviousness all the while unaware that his reason is completely ruled by his emotions. He was accorded the longest ovation of the evening for “Vedrò, mentr’io sospiro” in Act 3, but then he performed it apparently unfazed by the weight of Cherubim straddling his shoulder. Jane Archibald creates one the perkiest, most intelligent Susannas I’ve seen. She is in perfect, pure voice, and, given the oddness of her Figaro often has to do acting for two. Like any fine actor she acts even when she is not the centre of attention and it is pleasure to watch her react to what the others are doing. Emily Fons is quite close to the ideal Cherubino. She not only looks like a boy but knows how to act like one so believably that we tend to react her her as if she were a boy. She has a lovely, clear soprano and sings both her famous arias, “Non sò più cosa son, cosa faccio” and “Voi che sapete” with beauty and flair. Erin Wall suggests internal confusion in a very general way, but she is more comfortable expressing the Countess’s emotion through music. Her exquisite rendering of her pensive aria “Dove sono i bei momenti” is one of the highlights of the evening. 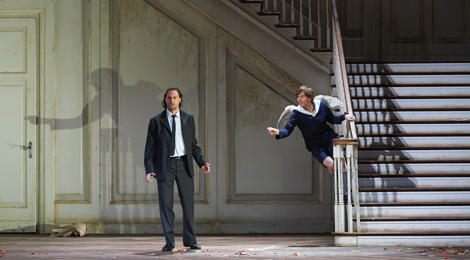 All the other roles are well taken – Robert Pomakov and Helene Schneiderman very funny as Dr. Bartolo and Marcellina, Doug MacNaughton as the bumbling gardener Antonio, and Michael Colvin as a menacing Don Basilio. The surprise of the evening was the bright, colourful voice of Sasha Djihanian as Barbarina, normally a minor figure, but here one you looked forward to with every entrance. If we imagine that Uli Kirsch is playing Puck instead of the useless Cherubim, it’s easy to see what a delightfully skilled actor and dancer he is with a natural glint of mischief in his eyes and smile. It would be a treat to see him in a play. In this production, however, we inwardly groan every time he appears because it means that the singers will suddenly lose their facial expressions and freedom of movement. Johannes Debus gives us one of the best Mozarts he has conducted. It is lighter in texture, sprier and more charming. While the COC Orchestra never achieves the spring of an orchestra of authentic instruments, it does at least sound like a fine modern orchestra giving a more historically informed account of the score. Jordan de Souza’s accompaniment of the recitatives on a modern piano are so beautiful you wish the recits would go on even longer than they do. The current COC production is not really a suitable introduction for newcomers to this opera. There are too many peculiarities and inconsistencies that they will assume are flaws in the libretto rather than flaws in the direction. Opera Atelier has its own Marriage of Figaro that is much more straightforward, more visually interesting and much more full of humour than Guth’s version. It comes around so often (last time in 2010) that it is worth waiting for. Those familiar with the opera will find themselves having mentally to blot out all the visual disturbances in order to appreciate the truly wonderful singing of the cast. We don’t normally go to see an opera with our eyes closed, but with some forms of Regietheater, as here, that is the way to have the most satisfying experience. Photos: (from top) Josef Wagner as Figaro and Uli Kirsch as Cherubim; Erin Wall as the Countess, Emily Fons as Cherubino and Jane Archibald as Susanna; Erin Wall as the Countess, Russell Braun as the Count and Jane Archibald as Susanna. ©2016 Michael Cooper.